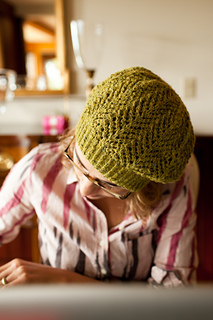 This hat pattern was originally written in 2009 for the LYS I work at. Enjoy. 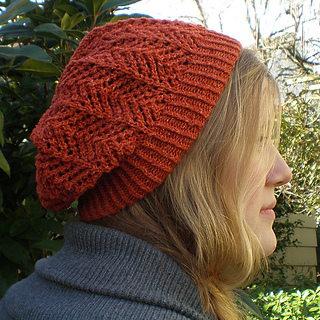 This hat starts at the brim with a twisted rib. You can easily change the length of the brim to suit. Increasing for the lace body of the hat gives this hat its slouch. if you desire a more fitted hat, the lace pattern repeats by 10 stitches, so just make sure you have a multiple of 10 after your ribbing. The lace is fairly simple, and a 4 row repeat, so easy to memorize and quick to knit. 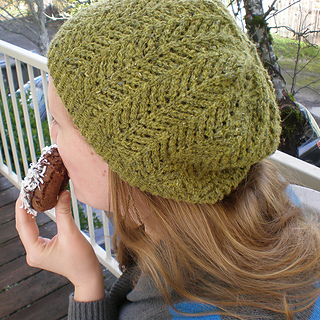 If you make your hat longer, you will need a second skein. Errata: 10/6/17: Just noticed a typo in the hat pattern for size large. The increase row (between ribbing and charts) should be to increase 30 (24) stitches to 140 stitches. Will be updated in the pattern once shortly.